My name is Orton “Brother” King. I live on Park Beach on the island of Bequia, which is the largest in the chain of the southern Caribbean island nation called St. Vincent and the Grenadines. I am a native skin-diving fisherman and because of my long concerns about creatures in our oceans going scarce, with some already extinct, I am trying to save one of these beautiful species—the hawksbill turtle—from extinction. 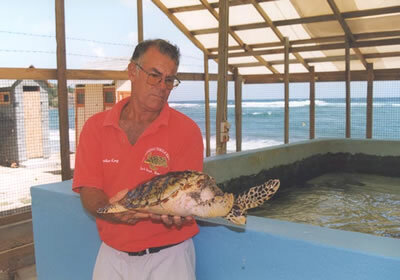 From boyhood, sea turtles always fascinated me, especially the hawksbill. Like me, divers and snorkelers are always thrilled to see a turtle in the ocean. Unfortunately, this turtle will be extinct in the Caribbean sooner than many expect. At 57 I retired from the ocean to dedicate my life to saving the turtles. My project involves monitoring beaches, checking nests, trying to protect mother turtles and eggs from poachers, collecting hatchlings, and taking them to my sanctuary to keep them safe during the most vulnerable years of their life. Outreach to our island youth regarding this fascinating species is also an important part of the sanctuary's mission. I keep the turtles in my sea-water ponds, feeding them on canned tuna for six months. Then they are fed small fish (sardines, etc.) until they are 3 years old (14 inches long) at which time they are released into the ocean. This gives them a better chance to survive, and instead of one from one thousand reaching maturity, this project will help repopulate the ocean sooner with about fifty from one hundred. The Old Hegg Turtle Sanctuary is making a big difference in the survival of these creatures. I have been in operation now for over twelve years and have already released 2000 three-year olds with my special mark (a hole drilled in the back end of the shell). Divers are seeing these marked turtles throughout the waters of the Grenadines. I would like to share this World Wide Panorama of the Sanctuary with you. Thanks, Bruce!